Hinge lets your side or rear trailer door swing open 180 degrees. Non-removable pin provides extra security. 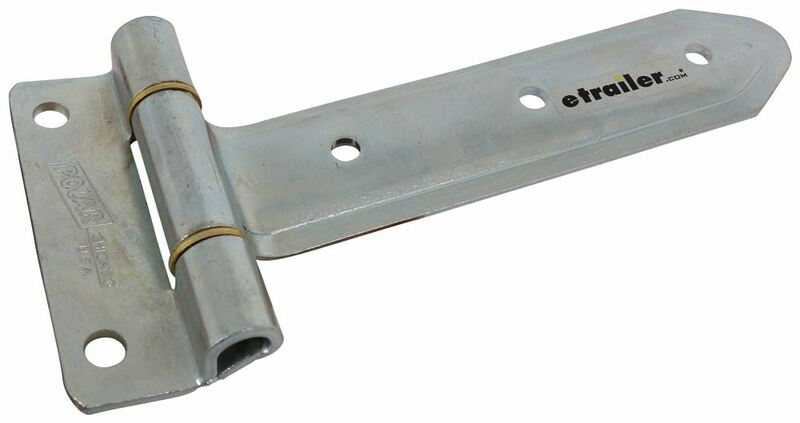 Durable zinc-plated steel construction. 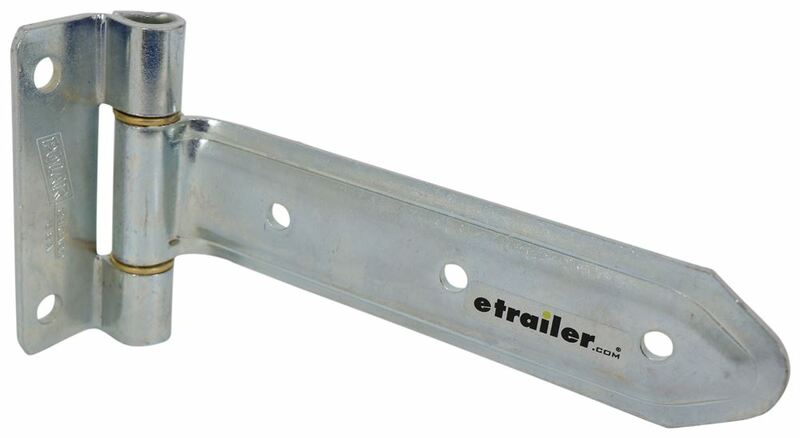 Call 800-298-8924 to order Polar Hardware enclosed trailer parts part number PLR3408 or order online at etrailer.com. Free expert support on all Polar Hardware products. 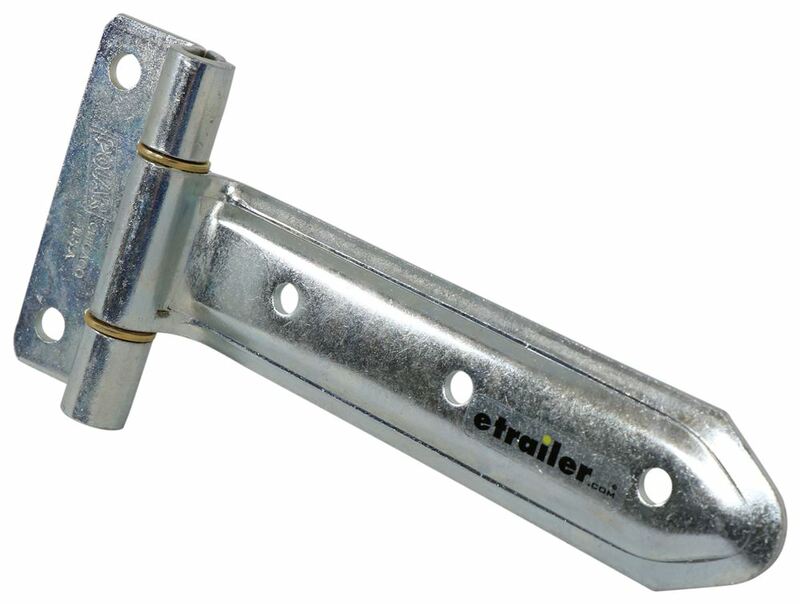 Guaranteed Lowest Price and Fastest Shipping for T-Strap Hinge for Side and Rear Trailer Doors - 8" Long - Steel. Enclosed Trailer Parts reviews from real customers. Hinge lets your side or rear trailer door swing open 180 degrees. Non-removable pin provides extra security. Durable zinc-plated steel construction. I want to say around nine and five-eighth's inches. When it comes to the bracket right here, this unit measures one and five-eighth's inches by four and a half inches. The mount holes are separated on center apart from one another by three and one-quarter inches.The strap itself from the center of the pin to the end of the strap gives us a measurement of eight inches. Overall width of the strap, that measures two inches wide. And the mount holes on the strap are separated on center. Apart from one another there's three of them. These are all separated on center by two and seven-sixteenths inches. The pin diameter right here is a half inch. When it comes to the mount hole diameters on these, we're looking at five-sixteenths, and on these we're looking at around three-eighth's inches. 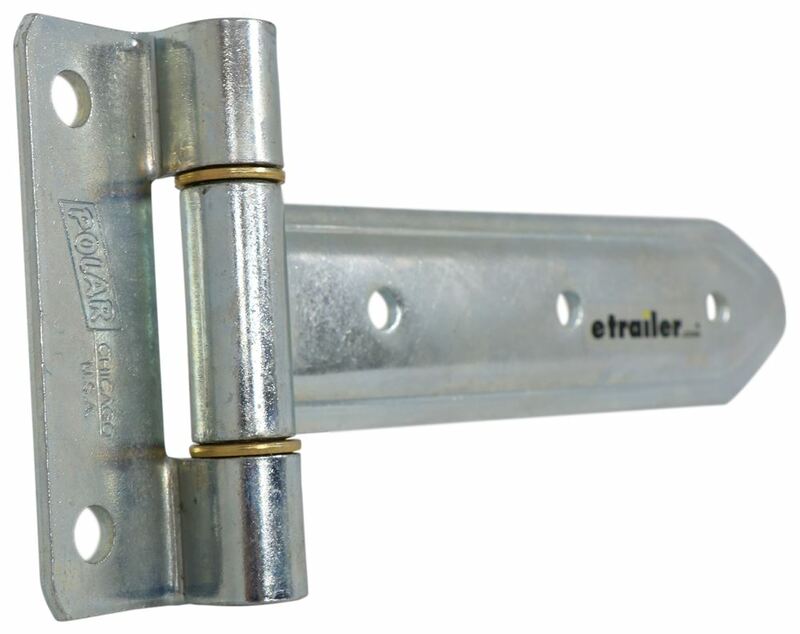 Mounting hardware not included.That's going to do it for today's look at the T-strap Hinge for side and rear trailer doors..
Order: RelevanceNewestRating - High to LowRating - Low to High Hinge lets your side or rear trailer door swing open 180 degrees. Non-removable pin provides extra security. Durable zinc-plated steel construction. 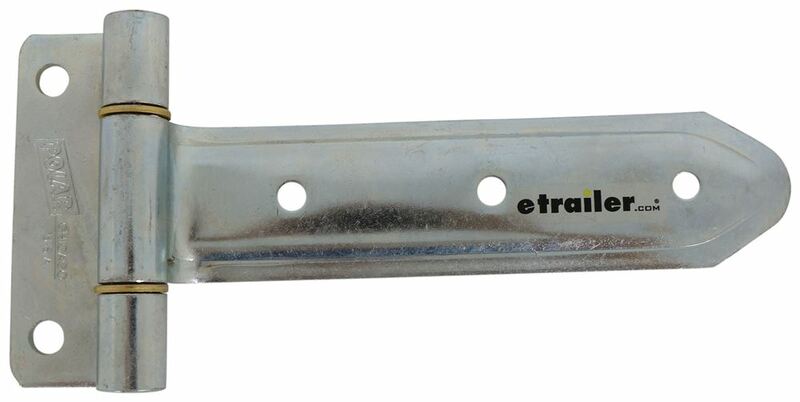 The Polar Hardware T-Strap Hinge # PLR3408 referenced in your question has a bracket dimension of 4-1/2 inches wide and 1-5/8 inches long. 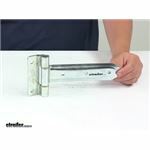 The overall length of the unit is 9-5/8 inches. I have also included an image with these dimensions labeled for you to check out.